Root vegetables are common staples in winter–back before modern refrigeration, root vegetables would be stored in “root cellars”, which were often just dirt cellars below the house that kept the vegetables cool. Because root veggies have such a long shelf life, they provided an important boost to the diet when other produce was out of season. 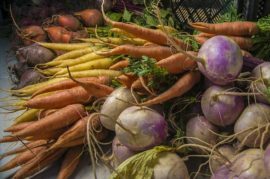 Some diet fads have vilified root vegetables, but they can be a healthy addition to your winter diet, too. Because of their high carbohydrates, it’s helpful to think of root vegetables as more like grains than veggies. They still form an important part of your diet, but you need to add and balance them in a different way than you would leafy greens. Don’t forget that there is no such thing as a “good” or “bad” macronutrient; Fats, Carbohydrates, and Protein all simply energy sources that have different functions in your body, and you need a good balance of all of them to be healthy. According to Harvard Health Publishing, “Root vegetables grow underground at the base of a plant. Technically they’re not all roots; some are bulbous growths that store nutrients to feed the plant in colder months. Examples include bulbs (fennel, onions), corms (celery root, water chestnut), rhizomes (ginger, turmeric), tap roots (beets, carrots, parsnips), tuberous roots (sweet potatoes, yucca), and tubers (potatoes, yams). Part of what makes people think that root veggies like potatoes are unhealthy is how we tend to prepare and serve them. Potatoes, onions, carrots and beets are actually pretty low in calories on their own and the starch helps you feel full. But when you boil and mash them with a big serving of butter and sour cream, potatoes add a lot of calories very quickly. Instead, try unexpected flavor combos and different cooking methods to make a great holiday entree, like roasted parsnips with pistachio and lemon, barbecued carrots with yogurt and pecans, miso-glazed turnips, or Jerusalem artichoke with shallots and toasted hazelnuts. Here are some more unique recipes to try. Yum! Because we tend to think of root veggies as merely starch, you may be surprised to learn how full of nutrients they really are; it makes sense, since the root is often where these types of plants store up their water and nutrients while growing for the plant to use later. For example, an average-sized baked sweet potato is only about 100 calories, but can meet your whole day’s recommended serving of Vitamin A. A cup of raw carrots can also meet your vitamin A needs. A cup of mashed turnips is only 50 calories, but has almost as much calcium as cheddar cheese. A russet potato with the skin on, meanwhile, has more than twice the potassium of a banana! To learn more about your particular dietary needs, please consult a licensed dietician.